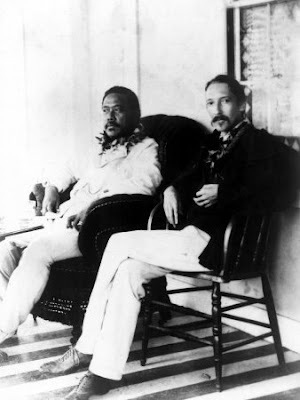 Congratulations to Mary Lynn who correctly identified Robert Louis Stevenson and King Kalakaua of Hawaii! Good job! The two great loves of Robert Louis Stevenson were adventure and Fanny Vandergrift Osbourne. Stevenson met Fanny in Grez-sur-Loing, the artist community south of Paris in 1876 and they became romantically involved. Fanny returned to her home in San Francisco in 1878, but the smitten Stevenson set out for California in 1879 and the two were married in 1880. 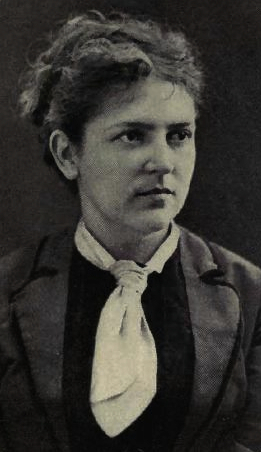 After living for a time in San Francisco, their family returned to Stevenson's homeland of Great Britain. After the death of his father, Stevenson decided to find more mild climates for his respiratory health (the author had rarely been healthy). 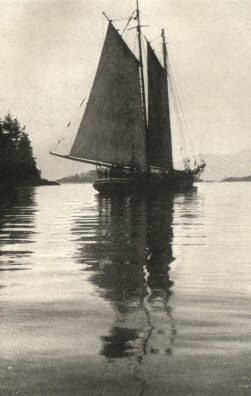 They at first settled in upstate New York in 1887, but the next year, he chartered a yacht and sailed with his family across the Pacific. 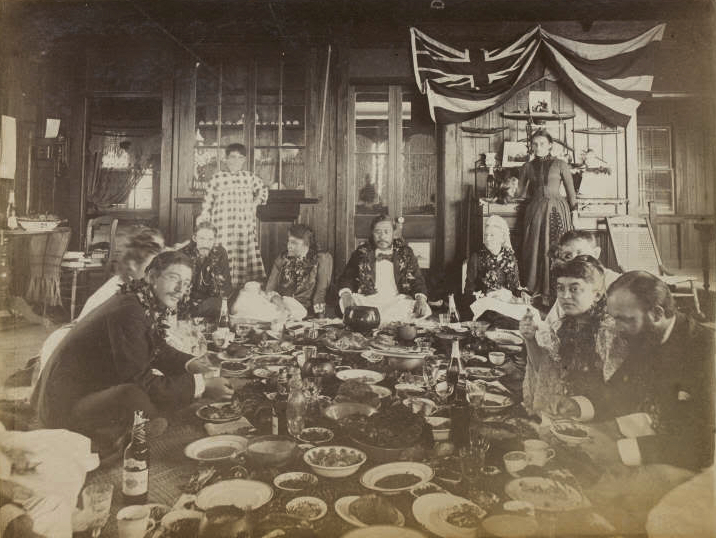 Stevenson landed in Hawaii in 1889 and was welcomed as an international celebrity. 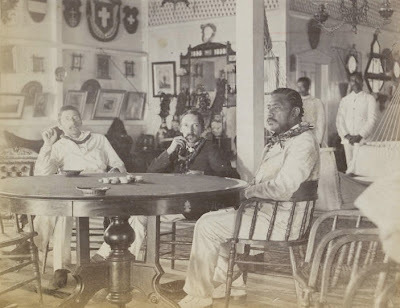 He soon became fast friends with King Kalakaua and the royal family and spent an extended stay in the Hawaiian islands. Like Stevenson, King Kalakaua also had health problems and under advice of his physician, traveled to San Francisco. His condition worsened and the king died in San Francisco in 1891. The Stevensons stayed in Hawaii for a couple more years and eventually left the islands in 1893. The family continued their Pacific travels and eventually settled in Samoa, where Robert took on the Samoan name Tusitala and became well respected and influential among the natives. Robert Louis Stevenson died in Samoa in 1894 and is buried there.